Every day we’re flooded with clients searching for all sorts of vendors, from multipurpose entertainers to specialized event professionals. Since there’s no way of knowing exactly who or what they’ll search for, your best bet is to maximize the number of relevant categories that you’re listed in. More often than not, we find that clients refrain from super-specific searches right off the bat. When they’re first getting started, they might not know what kind of jazz band they want, or even that there are multiple types to choose from; they’re simply searching for a “jazz band.” Which is why it makes sense to always opt for categories with widespread appeal. Of course, we aren’t discouraging you from also selecting more technical category types. For every 100 people who search for a “Comedian,” an estimated 20 of them wind up keying in a specific type, such as “Standup Comedian” or “Clean Comedian.” So while the general category type might be the most popular, why deny yourself more leads by not getting in on the more granular ones, too? Generally speaking, broad may be better, but it’s undoubtedly important to accurately check off any and all detailed categories that may apply to your business. 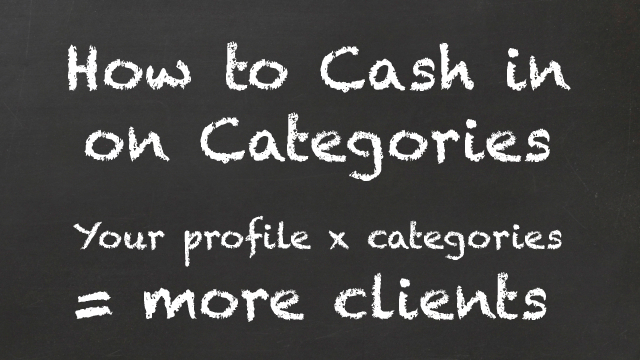 If you’re on the fence about opting for a general or more specific category type, think about it this way: your Primary Category should be a catch-all label for your line of work. Because it’s one of the top factors considered in generating your place on a search results page, if you select a popular label for your Primary Category, you’ll be maximizing your level of exposure in that field. Similarly, your Secondary Category should encompass the most relevant classification of your work (i.e. what type of artist, entertainer, or service provider you are). As for your remaining categories, that’s where you can, and should, get as precise as need be. There you can list off as many applicable variations as you’d like. While more categories can lead to more, well, leads, we aren’t advising you start checking off any old category. The ones you select should obviously be relevant to your type of work. Otherwise, you’ll be setting yourself up to field irrelevant inquiries– a surefire way to waste yours and the client’s time. If you remember nothing else, keep in mind these rules of thumb: (1) the more categories that your business is listed under, the more chances you’ll have to be featured on a wider variety of search results pages; (2) the more in-demand a category, the more leads you stand to receive by listing in it. If you aren’t sure what other categories can be considered relevant to your business, or which are the most sought-after in your area, give us a call at 866-342-9794. We can dig into the data and discover which categories can help you rank and reel in more clients!